Skellefteå Airport and Caverion have signed an agreement for the delivery and installation of LED lighting on the airport’s runway. The agreement includes the landing lights on the runway, which today is 2,100 metres long, and covers also an extension of 420 metres. Skellefteå is located in Northern Sweden. LED lighting consumes significantly less power and decreases electricity costs. The technology additionally provides a longer life span in comparison to non-LED lighting. Skellefteå Airport is the first airport in Sweden to convert its runway landing lights to LEDs. In addition to replacing the existing luminaires, Caverion will install new landing lights in 2019 when the runway will be extended. “I have a great relationship with Caverion and have worked with them for ten years,” says Per-Erik Morén, Project Manager at Skellefteå Airport. “The client was so satisfied that they wanted to continue working with us, which made us delighted. 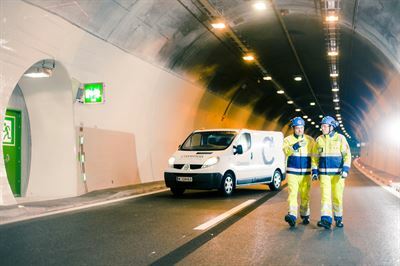 It is an agreement based on solid trust,” says Johan Wåård, Service Manager at Caverion. Since it is the first runway in Sweden that will be converted to LED lighting, Johan Wåård's hope is that LED conversions will become more popular and that Caverion will be at the forefront of this development.